If you are getting bored of the current enemies of Minecraft, take a look at this mod. 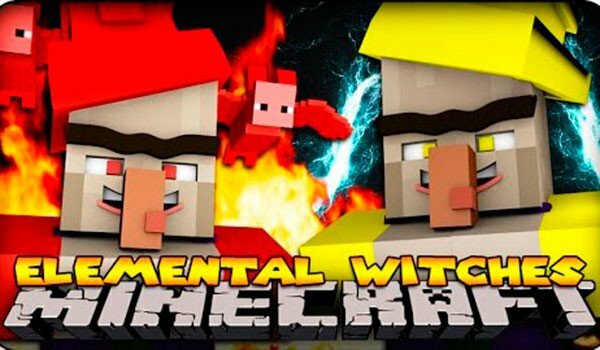 Elemental Witch 1.7.2 and 1.7.10 is a mod which as its name suggests, adds new types of witchs in the game, which are even more powerful (in case the regular ones weren’t enough…). We find a total of 9 new witches, which have elemental powers like: fire, water, earth, air and dark of witches, among others. Each one of them has powerful special abilities that will shake your knees. These witches appear in their temples, which are randomly generated when crating a new world, so, to go to fight against the Fire Witch, we go in search of the Fire’s Temple, and so with the other witches. To kill them (which won’t be easy..) you can get new weapons, items and eggs. These eggs eventually generate a specific pet depending on the elemental power of the witch, so, if you want to get different pets, you must kill several witches. Pets defend us from the enemy and you will have to asseble them. How to install Elemental Witch Mod for Minecraft 1.7.2 and 1.7.10?